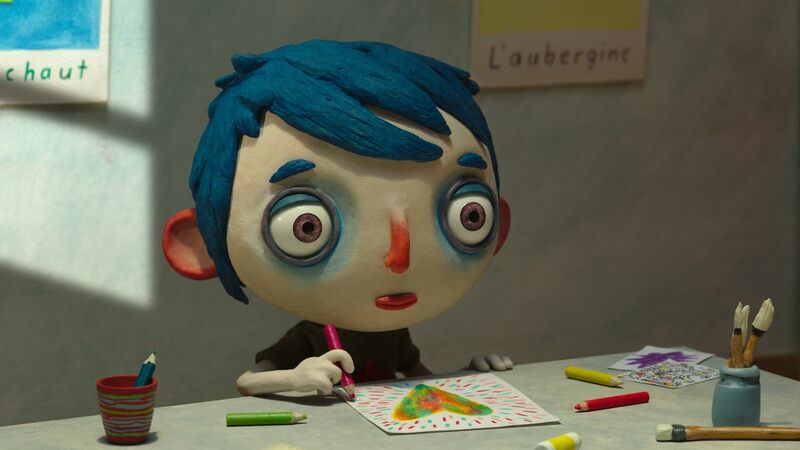 The core concept of My Life As A Courgette, a French animated film that made a surprise showing in the Best Animated Feature Film category at the Oscars this year, seems incredibly dark: A little boy named Icare, called Courgette (Zucchini, translated) by his drunk, abusive mother, accidentally kills her and is forced into an orphanage. There, he meets a small group of kids with heartbreaking issues, from the little girl whose mother was deported who runs outside in hope every time a car pulls up to the child who was abused by her parents who shakes uncontrollably and doesn't seem to talk. As one of the kids fairly morbidly puts it: "We have no one to love us." It would be easy for the film to wallow in this sentiment, but it never particularly does. Because after a fairly bleak opening, My Life As A Courgette reveals what it is actually about: Building your own family. Courgette, like so many of the kids at the orphanage, has been broken by a situation beyond his control, but the movie smartly argues that while family is necessary, anyone can be family. No one is so damaged that they can't be loved, or don't deserve to be. The opening to the film is dark. I don't mean it is explicit or violent; rather, it takes Courgette's emotional inner-life seriously. The opening few minutes of the film find Courgette very nearly mute, first, it seems, with fear over what his mother might do as she drinks, then later with grief. There is explicit acknowledges that he can love and miss his mother without dismissing that she is abusive. But Courgette tips its hand a couple minutes in, when the kindly cop who drives him to the orphanage slows down to allow Courgette to fly his kite out the window of the cop car. Managing a tonal shift like the one Courgette undergoes is incredibly difficult. The kite scene helps moderate expectations, but the slow shift as Courgette himself begins to come out of the shell of his grief - helped along by outgoing bully Simon and charismatic new prankster Camille - can still feel pretty rocky at times. It is the characters that ground these two conflicting tones, and the film never loses sight of who these children are. Thankfully, the film's absolutely gorgeous stop-motion animation is always wonderful to watch, even during the darkest moments of the movie. The characters are beautifully designed, from Courgette's grief-stricken blue color palette and general potato shape to the earthy, steadfast design of the police officer or the bright reds of the bully, Simon. So much of Courgette is character-driven, and having really evocative designs that help us understand the characters at a quick glance is vital. Courgette excels at this kind of nonverbal storytelling, its clay characters able to convey immense feeling -- and playfulness. I am not used to family films that are this okay with being quiet. American animation tends towards activity above all else, making sure there is always something happening on the screen, but Courgette understands that sometimes, you just... have to be sad. Many of the best, most enduring movies for children are the ones that break the sugar-rush cycle and make them feel like they can see something of their lives on the screen, and I think My Life As A Courgette has the potential to be one of those movies. This is a movie of small moments, its most important 'plot' lasting maybe 10 minutes, meant to make us feel for these orphaned boys and girls, to allow us to sink into the visual artistry of the world. Running just over an hour, My Life As A Courgette is incredibly short, but it packs a lot of heart - and a lot of entertainment - into that hour. Its dark tone and sometimes eerie character design should appeal to fans of things like Corpse Bride or The Box Trolls, but Courgette is ultimately sweeter than either. Indeed, Courgette reminded me of nothing moreso than Moonrise Kingdom by way of Short Term 12, an emotional story about young love transforming a broken community into a home. Melancholy, earnest, and warm-hearted, My Life As A Courgette is a resolute charmer well worth seeking out, with a family or on your own. My Life As A Courgette is out now in limited release, and will be coming to the Midtown Art Theater in Atlanta on March 10th. Written by Celine Sciamma adapting a book by Gilles Paris and directed by Claude Barras, My Life As A Courgette was nominated for Best Animated Feature Film at the 89th Academy Awards.